Although this is technically stealing time from your employer (unless you do it on your lunch break), most will look the other way if it's only for a few minutes out of the day. And those accounts don't eat up a lot of time. 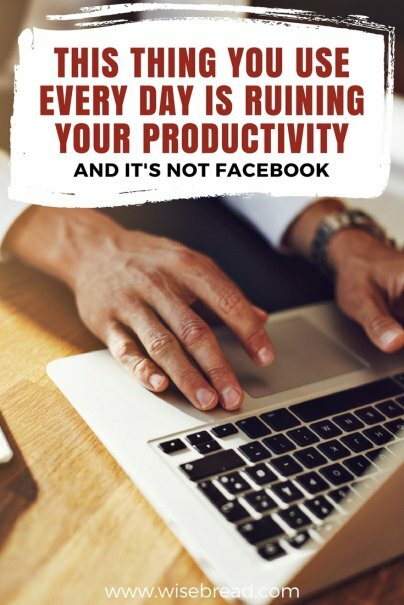 Facebook users spend about 30 minutes per day on the site, on average, and most of that is done outside of the work environment. However, email is something many of us actively use at work. It's part of the job, and it's the main way to communicate these days. One of the most obvious ways to combat this is simple, but improbable in this day and age: Shut the email off, at least for a few days. Of course, that will end in disaster for many. "Where's my report? Why hasn't the shipping problem been dealt with? We're losing an account, why isn't someone talking to our client?!" So, knowing that we can't turn email off, what can we all do to stop email draining the life out of the office? Here are some handy tips to stop email from killing your productivity. I see a lot of emails that could easily be done as conversations in a meeting room, office, or a telephone call. In this day and age, it's very easy to just open up your email to shoot an idea off to somebody, but it's time consuming and keeps you in your email account. Once you're in there, it can be distracting. By all means use email to send important documents or instructions, but if it's simply "Hey, I was thinking of red for the front cover, how about you?" then you're wasting your time — and everybody else's. Please give your answer by 4 p.m. today. Call me as soon as you have an answer. Add your comments to this document and forward it by 11 a.m.
Read this email and reply within the hour. Constant email checking to see if someone has read and replied to your correspondence is a big motivation killer. But it doesn't have to be. Almost every email client gives you options to prioritize emails and to receive notification when the email has been read. Delay: If you can't work on it now, put it in a "to do" file. Act: If you can solve it immediately, do so. Re-assign: If you can't work on it, forward it to someone who can. Erase: If it's been dealt with, or you don't need it, delete it. Store: Archive it into the correct folder, and move on. The big problem with email is that it's always there. And it's always notifying you of new mail. It can be difficult to ignore, and that leads to a lack of thinking, and dedication, on projects that deserve your complete attention. So, for a couple of hours in the morning and afternoon, turn off your email. Give yourself time to really concentrate. The chances are, nothing is going to be so urgent it can't wait for two hours. But the benefits to you, and your job, could be invaluable. Do you have any other advice on using email at work? Let us know. I only recently got a smartphone so there used to be large chunks of the day when I would be totally disconnected. It actually became a problem because people expect a near immediate response (meaning within an hour or two, half a day at the most). I missed out on one too many last minute and quick turn around opportunities before upgrading to the smartphone and making sure my alerts were ON!